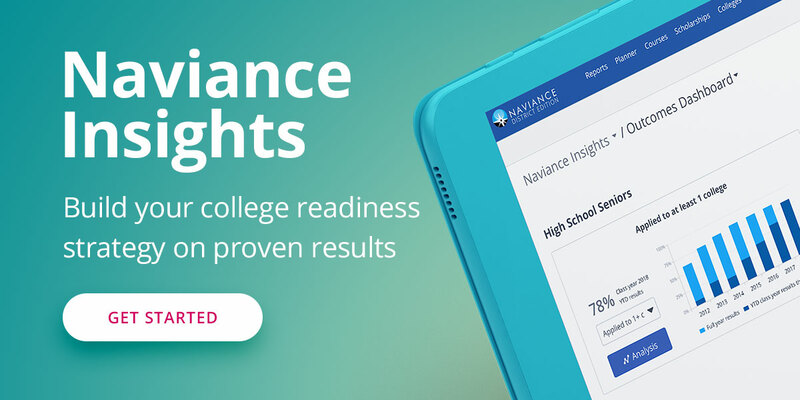 This is an update to a series of posts I wrote almost a year ago about my Road to Naviance which are linked to here if you would like to read it for some context. I hope to share some of the cool things that Family Connection has allowed us to do and some things I feel could be improved or better implemented through other means. Short history - when I came to my district (a smaller, rural school district with 2 comprehensive high schools and a continuation high school - ~ 1200 HS students total), I came with a personal mission to embed technology wherever I could. One of the first things I asked the superintendent was if he had heard of Naviance. Much to my pleasure - his last district used it and he used to be in the tech industry (score!). The fall of my first year (first year paid counseling job as well), I wrote and was awarded a grant to bring in Naviance district wide. The grant funded us for a year (basically the startup costs and year one student fees) and I am grateful to the district for picking up the costs for at least 3 more years. I am the person in charge of Naviance for the district and coordinate with the other two high schools. That brings us to today. I had introduced Family Connection to last years 9th - 11th graders in May 2013 so when we kicked into full implementation mode in August 2013, about 75% of students had registered, worked on a personality assessment, and utilized some of the college search features. I worked through the alphabet of incoming 9th graders and got about 20 students at a time in an intro Naviance lesson in the early Fall. That said, we still are not quite at all students registered due to absences, conflicts in schedules, and other things getting in the way. The majority of students who are logging in and using the tools are the upperclassmen who are researching careers and colleges in their advisory classes or at home. I have a departmental (department of one + intern) requirement that all seniors must add all schools to which they are applying to their accounts and reporting the college decisions. I am only seeing "Admitted" being reported as of now and anticipate not many will report being denied - I will have to brainstorm how to get more of the negative results reported. At senior checkouts, I will be updating their applied to lists before I sign off their forms to have correct data. If I were to give a word to where we are now - I would choose "emerging". Students, parents, and staff are slowly but consistently becoming more aware of the different and powerful tools that their Family Connection account holds. Just today I sat with a parent and student and showed off the college search tools and they were amazed. Things were said like "that is awesome" and "did you know you could do that?". It is a slow process. I would be lying if I said I was where I thought I would be, but I am not upset with the progress at my site knowing what I do now. The three different sites I "manage" are in hugely different places as well. From near full roll-out at my site, to kinda used at another, and non-existent at the third. This is not odd as the project was my baby - I am excited about using it to the fullness, but others are slowly warming and will hopefully catch up. This article is an excerpt from The Counseling Geek blog. To view the post in full, use this link.